For more than twenty years, the Asian American Writers’ Workshop has incubated emerging writers of color, including such writers as Cathy Park Hong, Tina Chang, and Jhumpa Lahiri. Last year, we created an utterly new fellowship that grants publication opportunities, cash, work space, and a residency at the Millay Colony for the Arts: The Margins Fellowship. 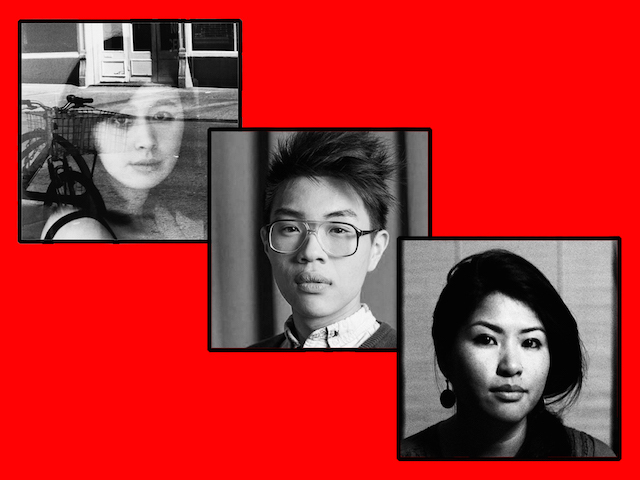 Join us as we celebrate the literary accomplishments of our first class of Margins fellows—Rowan Hisayo Buchanan, Wo Chan, and Muna Gurung—and hear them read with mentors Alexander Chee, Meera Nair, and Jennifer Tamayo. Read pieces by Rowan, Wo and Muna on The Margins and then reserve your seat today! THE FELLOWS: Margins Fellow Rowan Hisayo Buchanan’s novel-in progress involves a Japanese-American artist in 1970s Manhattan, the biracial son whom she abandons, a bald cat, a flasher, two babies, and six pieces of toast. Margins fellow Wo Chan is a queer Fujanese poet and drag performer who tackles issues such as immigration, performance, gender, and any other ideas of otherness, artifice, and contradiction. Margins Fellow Muna Gurung is a NYC educator who wrestles to explore and understand ideas of 'girlfriendhood' in her stories. THE MENTORS: Joining this year’s Margins fellows are writers Alexander Chee, Meera Nair, and Jennifer Tamayo. A past AAWW Van Lier Fellow, winner of the Asian American Writers’ Workshop Literary award, and a Whiting Award recipient, Alexander Chee is the author of the novels Edinburgh and the forthcoming The Queen of the Night. Meera Nair is the author of the short story collection Video, which won the Washington Post Best Book of the Year, San Francisco Chronicle Editor's Choice, and our very own Asian American Literary Award. Poet Jennifer Tamayo, is the author of the books Red Missed Aches Read Missed Aches Red Mistakes Read Mistakes and YOU DA ONE, two multimedia poetry collections that interrogate the meaning of immigration and identity in the Post-Internet age. Do not miss this opportunity to learn how these writers are defining the future of Asian American literature!